What's the differences between Blu ray vs DVD vs 4K UHD? We always regard Blu-ray discs as the guarantee of highest picture quality, but how about the HD DVDs? And now the format battle has spread to 4K UHD as this fledgling high resolution is becoming a particularly welcome recently. Should we pay extra money on 1080P Blu-ray over DVDs, or stay with 4K streaming? Now we need a comprehensive 4K vs Blu ray vs HD DVD comparison to pick the winner of this high definition format war. MacX Video Converter Pro, a HD video downloader that will help you free download Blu ray movies, 2160P 4K UHD, 1080P/720P HD, 3D from 1000+ sites without any quality loss. Simply Add URL - Choose output format - Start to download, and there your Bluray or 4K videos are! 3 steps only! Simply put, in Blu ray versus DVD comparison, Blu ray discs excel most DVDs in the aspect of image quality. As for standard DVDs, most of them have a a standard definition resolution of 480 or enhanced definition resolution of 520. This quality will give enough clear image on standard TV if you sit far enough. But movies on standard DVD may look grainy on the HDTV. That's why why Blu ray is better than DVD in a way. The HD DVD, which supports up to 1080P resolutions, will primarily compete with Blu-ray discs. Blu-ray discs can host up to 1080p resolution (1920×1080 pixels), at up to 60 (59.94) frame rate. Compare Blu ray and DVD, the former is more suitable for the HDTV display. However, when Blu ray disc vs HD DVD, the similar resolution and same media encoding method will result in equivalent visual quality, which means we can hardly tell the difference between Blu ray and HD DVD if we are not sitting pretty close to the TV or the TV is not that big. But you should note that HD DVD is now officially discontinued. Speaking of resolution, 4K UHD will fully deserve to be the winner in the 4K vs Blu ray vs DVD battle. The biggest difference is that 4K supports resolutions up to 3840 x 2160 (4K), while others cap out at 1920 x 1080 (1080p). This significant difference however seems to be surprisingly subtle for human eyes. To sum up, in the quality round of Blu ray vs DVD vs 4K Ultra HD, 4K is four times better than Blu ray, while Bluray is six times higher than DVD. Storage means that how much data can the format hold. A standard DVD can host about 4.7 GB of data, about two hours of movie. This kind of DVD is referred as DVD 5, while the dual layer DVD, referred as DVD 9 compared with DVD 5, can host twice the amount of data to about 8.5 - 8.7 GB. Accordingly, a dual layer DVD can host four hours of movie. How about Blu ray versus DVD? Compared to DVD, Blu-ray disc means five to ten times increase in storage. Indeed, there are Blu ray advantages over DVD in capacity: Bluray disc have 25GB on single layer and 50GB on dual layers. This is a significant increase, even in Blu ray vs HD DVD, which hold 15 GB and 30GB on single and double layers respectively. 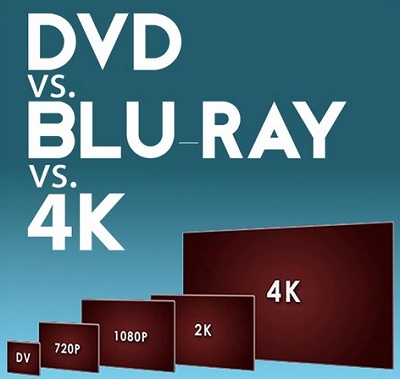 So which will win in DVD vs Blu ray vs 4K Ultra HD? In fact, the Ultra HD 4K can hold between 66 to 100GB of data, far surpassing HD DVD or Blu ray. Compared to MPEG-2, H.264/MPEG-4 AVC used in Bluray and DVD, 4K codecs H.265, VP9 and AV1 provide better compression efficiency, 50% smaller in size. Note: Both Blu ray and DVD are fragile and easy to scratch or fingerprint. A great way to safekeep them against any damage is to copy DVD to hard drive, so that you can also archieve the discs and play them on the go. Compare Blu ray and DVD, more resources are available on DVDs as Blu ray is a relatively new technology. 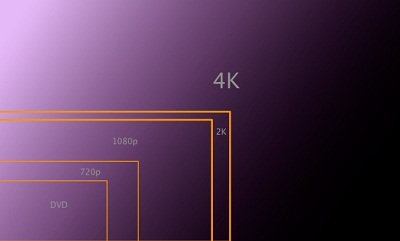 The concept of 4K can date back to as early as 2004, but it didn't come into vogue until 2014. Fewer movies are thus in 4K ultra HD compared with Blu ray and DVD presently. Put aside numerous DVD movies, some outstanding titles in Bluray include The Wizard of Oz, Avatar, Gravity - Diamond Luxe Edition, Iron Man 3, The Dark Knight Rises and more. As for the 4K UHD resources, there are many extraordinary 4K movies videos on Netflix, YouTube, Amazon, Sony etc. If you're interested in any Bluray or 4K movies, you may free download 4K UHD, Blu ray 3D movies to compare with DVDs. Many users are wondering if they can play blu ray disc on regular DVD players. The answer is no. This is because that data stored on Blu ray disc need blue laser to read while the red lasers used in regular DVD player are too large. In the Blu ray vs DVD comparison, the latter obviously enjoys greater compatibility as it can be played on both regular and Blu-ray players. Tips: to make DVD movies compatible with more devices, like phones and tablets, you may rely on a professional DVD ripper like MacX DVD Ripper Pro to rip both homemade and protected (Disney/Paramount/Warner Bro. more) DVD collections to iPhone iPad Android devices with original quality reserved. Here is also the recommendation of best DVD ripper for Mac review for you to make a digital copy of discs for mobile playback. As for Blu ray versus DVD fight in this regards, the Blu-ray discs are limited to Blu-ray players only, which however have the ability to playback standard DVDs. Well, 4K UHD is not of greater flexibility in Blu ray vs DVD vs 4K comparison. We know that in Bluray vs 4K review, both formats provide high image quality, which disable many players online. Tips: Well, if you want to play 4K UHD movies videos on mobiles, a reliable 4K video converter like the above mentioned one can help. Despite which is more compatible in 4K vs Blu ray vs DVD review, if you want to play the three formats freely on Mac or PC, another option is to pick up a versatile 4K UHD video player which can host the three and more formats in high quality like 5KPlayer. Generally speaking, a regular DVD movie is priced at $14.99 on popular sites like Google Play, VUDU, Amazon. Even when Blu ray vs HD DVD, the former will be more expensive that users will need to pay extra $5 to $10 for the Blu-ray version. You may download 4k video free from YouTube to or pay for up to $99/year Prime subscription price on Netflix. 5KPlayer - 100% free video player to play Blu Ray, DVD and 4K Ultra HD video on Windows PC and Mac OS X. Also free download Blu Ray videos, 4K/8K videos from YouTube, Dailymotion, Vimeo, Myvideo, Facebook, etc. 1000+ video sites. In a nutshell, to compare Blu ray and DVD, Bluray format is obviously superior to DVD in many aspects. While in 4k UHD vs Blu ray fight, Blu ray format succumbs in the image quality war. While being the future of high resolution market, Ultra HD formats however will not make your HD Blu-ray collections obsolete. As we see from the above, both Bluray, DVD and 4K have their own merits. Put aside that which format will you prefer in DVD vs Blu ray vs 4K, here we also share your tips on how to watch DVD in high quality more easily on mobiles. Well, MacX DVD Ripper Pro, is able to all types of encrypted DVDs and copy-protected DVDs (by removing DVD CSS, region code, RCE, Sony ArccOS, UOPs, Disney, etc) with up to 36x faster speed and not a bit quality loss. 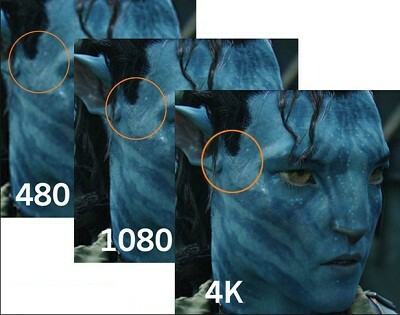 What's the difference among 4K, 8K and 10K? the 4K vs 8K vs 10k comparison gives the in-depth analysis of 4K UHD, 8K FUHD and 10k QUHD resolution and introduces a professional way to download 4K movie, 8k video and 10k clips with high quality reserved. Want to download 4k Ultra HD video and movie with no error? Here we've covered everything about 4K & 8K, including must-have 4k video downloader to capture 4K UHD video, the best 4K player for 4k video playback, top-rated 4k TVs, contents and movies filmed in 2160p/4096p, as well as some useful tips for 4k video download. MKV vs MP4: Which One Suits You Better? MKV or MP4, wonder know which one to choose? This article gives a brief comparison between MKV and MP4 to help you choose the right one that suits your needs better. 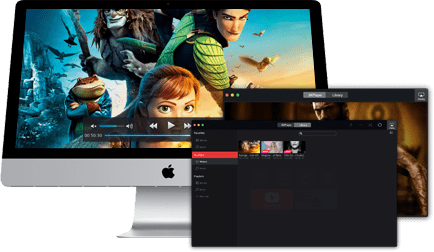 MacX Video Converter Pro is expert in downloading 8K/4K 2160p ultra HD, HD 720P, 1080P, 3D, Bluray videos from YouTube and other 1000+ sites as well as converting the downloaded video to MOV, FLV, WMV and more common video formats.